A year after opening, this grand palace served as the headquarters for the Republican National Convention. (The year was 1928 and Herbert Hoover was the nominee.) After sitting empty for 25 years, the hotel returned to its classic charm in 2005—complete with its legendary Drum Room restaurant, where greats like Frank Sinatra, Patsy Cline and the Marx Brothers once performed. The AAA Four-Diamond property still boasts a prime location, nestled at the door of the new downtown entertainment district. 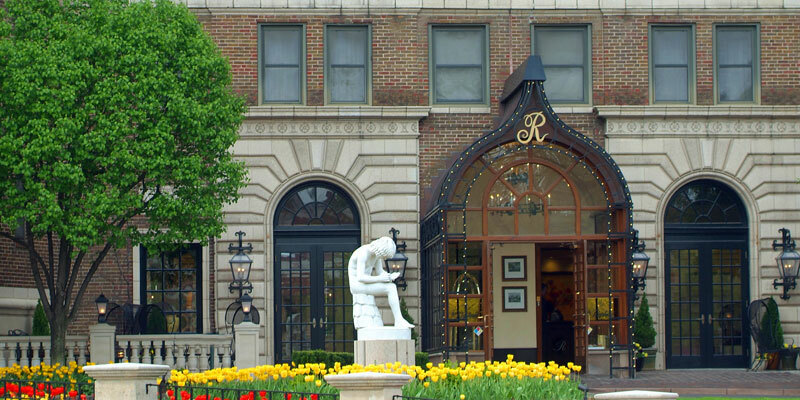 Listed on the National Register of Historic Places, this boutique hotel has been a fixture of downtown KC since 1926. Easy to spot for its blue terra-cotta roof, the Aladdin was once the tallest building in Kansas City. During its heyday, the hotel played host to mob bosses and celebrities alike; heavy-hitters like Mickey Mantle and Greta Garbo were among the famous guests to bed down. The vintage hip Aladdin made its big comeback in 2007 as part of downtown’s revitalization. Characterized by its swanky décor and bold color scheme, the Aladdin is a prime example of KC’s love for everything Art Deco. Less than two blocks from the famed Country Club Plaza, this New England-style B&B operates out of a gorgeous 1913 Colonial Revival home. From Russell Stover to Thomas Hart Benton, each of the 12 stately guest rooms is named after a prominent Kansas Citian, bearing room décor that reflects the namesake’s personal history or the era in which he or she lived. And the accommodations aren’t the only thing getting attention at this Mobil Four Star property (a six-time winner); the inn’s gourmet barbecue breakfast has twice been featured on The Food Network. Originally constructed as the Villa Serena Apartments in 1927, this Spanish Renaissance Revival building was transformed into the elegant Raphael in 1975. Voted one of the world’s best places to stay by Travel + Leisure and Condé Nast, the upscale boutique just completed a multi-million-dollar revamp in 2009, strutting a new look while holding tight to its 20s authenticity at the same time. In addition to a fresh décor that you can almost hear pop, the Raphael’s house eatery (Chaz on the Plaza) is quickly redefining what it means to be a hotel restaurant. This historic hotel was once billed as the home of a “Room and a Bath for Two and a Half” (or $2.50). Although its signature rate didn’t stand the test of time, the hotel’s extravagance is still intact. Reopened in 2001 after a $20 million renovation, the opulence is captivating as ever. The Phillips is a frequent feature in national travel magazines, including Southern Living, which praised the Phillips for its alluring, “Gatsby-esque" appeal.